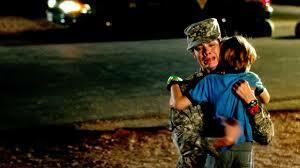 Fort Bliss, written and directed by Claudia Myers, came out in December. It’s the second feature film for Myers. She also wrote and directed Kettle of Fish starring Gina Gershon and Matthew Modine. She’s made lots short films and documentaries for the military such as ones about combat stress and PTSD and severely injured soldiers returning from Iraq and the impact to their personal lives. 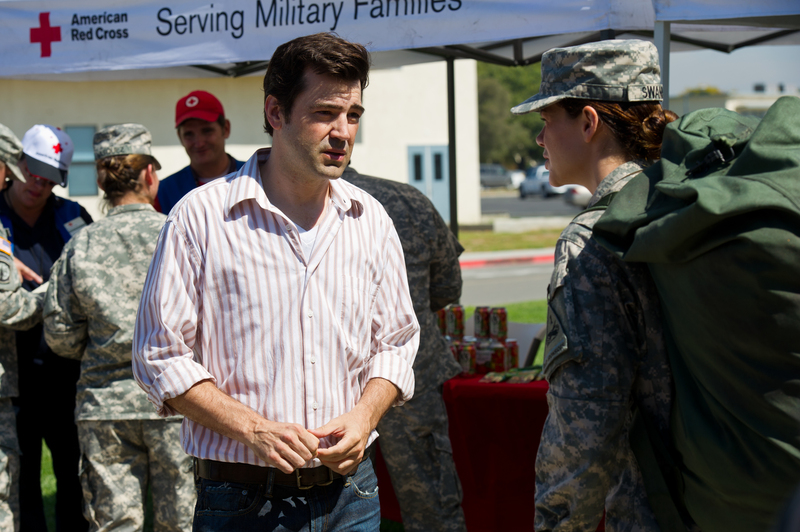 Fort Bliss movingly and effectively shows the difficulties that a single mom in the military faces in balancing her career as a medic and her home life. 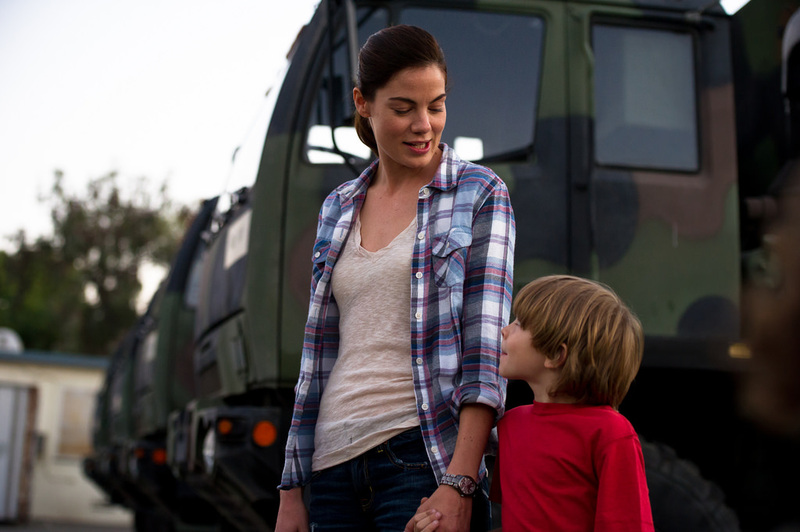 Michelle Monaghan turns in a strong, edgy and multifaceted performance as Maggie. It’s currently streaming on Netflix and iTunes and absolutely a must-see. After some back and forth on twitter, Claudia Myers and I spoke on the phone a few weeks ago. Amy Steele: You live in DC– outside the Hollywood scene but close enough to New York. How is that for you as a filmmaker? 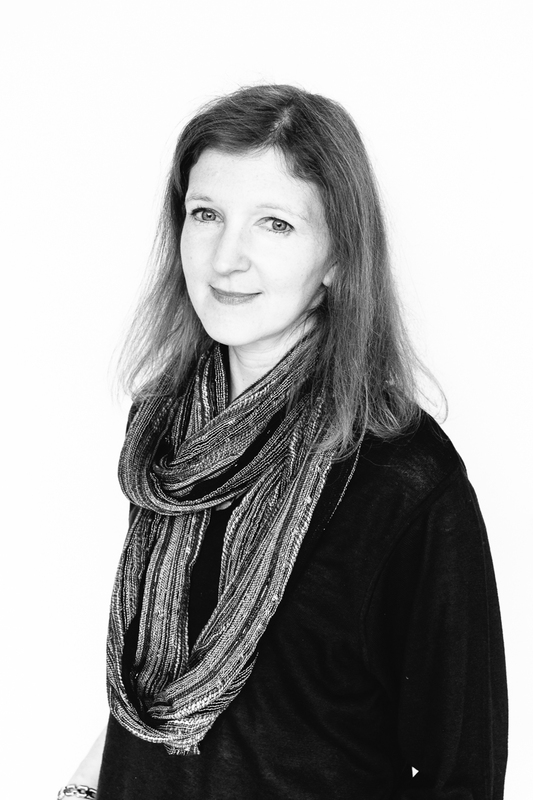 Claudia Myers: Positive is that I wouldn’t have written Fort Bliss. That first assignment to work with the military with a local company. I wouldn’t have had that opportunity in another city. It sparked my interest in the military stories. I like the Wash DC film community. It’s much smaller but it’s very supportive and I receive a lot of support from American Univ. DC is a diverse city in terms of its interest. It’s not dominated by film and it can be a positive. Amy Steele: Do you think you can live anywhere and be an independent filmmaker? Claudia Myers: Depends on what you want to do. If you want to work in TV or film it helps to work in NY or LA but there’s also more competition but to write and direct your own project it helps to be in places where there’s smaller film industry. Amy Steele: You’re a professor of film at American University. What do you like about teaching? What influence does it have on your film-making? Claudia Myers: I’ve been teaching for seven years. Being a teacher and being a filmmaker simultaneously forces me to keep thinking critically about what I do. So I feel like with every new class I learn something from my students. They challenge me to look at things differently or explain things better. It keeps me engaged and sharp and more current. Amy Steele: Where did you get the idea to write Fort Bliss? Claudia Myers: Working on a training film for the army at the actual Fort Bliss. Was doing a focus group with infantry soldiers and one was a single dad who had deployed twice to Iraq and I remember being surprised by that. I never thought about a soldier facing multiple deployments as a single parent. As a mother it piqued my interest. Was something I’d never thought about. Roughly 40% of women in the military are moms. As I developed the story, I felt like telling the ultimate working mother story. As any parent trying to balance with a career they think is meaningful and important with raising a child. There was a story to be told that hadn’t been told from a female perspective. I found it wasn’t such an unusual circumstance. I would hear “my sister is in that situation” or “I know someone just like that.” It is gratifying that it is a projection of this and interesting to get people thinking about how women are perceived. People would connect in a way that they hadn’t thought about. Amy Steele: Why did you make Maggie a single mom? Claudia Myers: That was a side of the story I hadn’t seen told and a side of the story I could relate to as a mother and get a strong sense of connection. A real empathy and curiosity for women in the military balancing career and being a parent. To make an independent film there has to be a reason to do it and I hadn’t seen that story told. Amy Steele: I didn’t think it all that unusual for a woman to serve in the military with a young child at home but I browsed a message board and people thought it strange. This was Maggie’s job. I don’t think she was trying to get away from her son at all but she liked what she did and was trying to secure a better future wasn’t she? Claudia Myers: I’ve had some conversations with people who don’t understand that she re-enlisted and then got caught in a set of circumstance. As in life there are no right solutions and people do the best they can under the circumstances. Everyone just does the best they can. I wasn’t trying to demonize anyone or make anyone a villain. As a filmmaker and viewer I have empathy for Maggie but she makes some questionable choices and that’s fine. We sometimes recognize ourselves in a character’s flaws. I wasn’t interested in making her perfect. Why is it cool for a guy to go off and fight and leave his family but for a woman she’s abandoning her family, she’s a terrible mother. Claudia Myers: Such an emotional response to the story is a good thing. It gets people to think about their feelings about these things. Things have been changing for a while. Can it ever be completely equal. I don’t know that I have an answer. That’s why I wrote the movie. I was happy when I was writing the script and I wasn’t sure how I could resolve this in a way that was honest. Amy Steele: How long did it take from script to screen? Claudia Myers: I got the idea about five years ago. I was intrigued by this character who was a soldier and a mother and was balancing these two sides of her life in an extreme situation. Worked on [the script] on and off for years. It took time to get funding. We had a leisurely editing process. It was good in that it was always on my mind but I wasn’t working on it constantly. The shoot itself was quick. We shot it in 21 days. Amy Steele: By choice or necessity? Claudia Myers: It’s never a choice. We always want more time. It was a very intense shooting schedule. It gave the whole process an energy. Everybody wanted to be there. Everyone on our team was really dedicated. That included a number of veterans on the film itself and active duty soldiers. That grounded the production. It helped creating a greater sense of authenticity. The army supported the film so we had subject matter experts. Michelle [Monaghan] was trained by a medic. The army was tremendous in their support. Amy Steele: Did you screen it at Fort Bliss? Claudia Myers: It opened at Fort Bliss and in NY and LA in December. Amy Steele: And what was the reaction? Claudia Myers:The reaction has been very positive. Also we had a Los Angeles screening by Veterans in Film and TV [VFT]. 400 veterans at LA premiere. The film got a standing ovation. it was a special night. Amy Steele: What kind of director are you? Claudia Myers: I love the whole process. I love working with actors. I just have a lot of respect and admiration for the actors’ craft. I see my job as being as clear as possible about what I’m trying to achieve. What the story’s about, what I’m fundamentally getting to and I work with the various departments to help me bring the story to life. I welcome their input so it’s a real collaboration. Amy Steele: What were the greatest challenges for this film? Claudia Myers: So many intense or logistically different scenes on a short time frame and budget. I think that was the overall production challenge. Michelle was so committed and so passionate about the script. As preparation she did an abbreviated medic course. She was a great collaborator. I felt that she understood all the sides of this character which I wanted to bring out. She didn’t hold back and she gave an incredible performance. The weather was another challenge. It was very hot. We shot in the desert in 100 degree weather. We felt the importance in sharing this story. •	29.8% of filmmakers (directors, writers, producers, cinematographers and editors) were female. •	Women were 16% of the directors, executive producers, producers, writers, cinematographers, and editors working on the top 250 domestic grossing films. •	Women directed 6% of the films. •	Women wrote 10% of the movies. Amy Steele: What are the barriers facing female filmmakers today? What do you think needs to change? Is it getting better? Claudia Myers: It is getting better. Maybe a little bit outside the studio. I think there are a lot of independent women directors/writers working. It isn’t a level playing field. There’s a lot of progress needing to be made. People can support films written and directed by women. They can seek them out and watch more of them. I think the more attention we pay it is a positive thing. I hope the trend keeps developing. It’s slower than it should be for sure. Distributors are still trying to figure out revenues with all these distribution strategies. It’s not what it used to be. We aren’t quite at the place optimally. In terms of female films being less lucrative, it’s demand driven. If people make a point of watching those films and more films about female protagonists. More films about women. The vast majority of mainstream films feature male protagonists. Some stories need to be told the way they need to be told. You need multi-layered complex women in film. Actresses are eager for more meaty roles. This entry was posted on February 9, 2015, 20:08 and is filed under DVD, Film, Interview. You can follow any responses to this entry through RSS 2.0. Both comments and pings are currently closed.